Sometimes the terms climbing and rambling roses are used interchangeably, but most climbing roses will typically re-bloom throughout the season. Rambling roses will only bloom once in late spring or early summer. Ramblers can cover buildings and their stems are often more flexible than climbing roses. Ramblers also have a greater mixture of wild roses in their immediate ancestry. 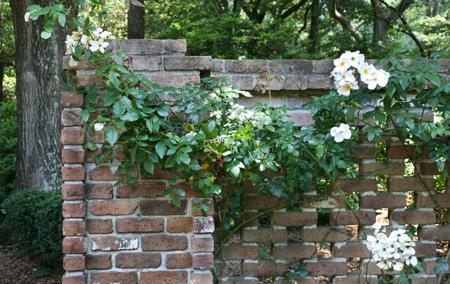 Climbing roses are more closely related to hybrids such as hybrid teas and floribundas. Climbers tend to have vigorous canes. Climbers are usually grown with some form of support and the climbers will often tend to continue growing straight up above this support. To direct growth and stimulate bloom on the sides of the arbor, prune young canes back according to how vigorous they are growing. Cut weak one-year canes back to 18" — 24". Prune slightly stronger one-year canes to about 3' and the more vigorous 1 — 2 year old canes to about 4'. Allow vigorous older canes to reach the top and form the horizontal stems running across the top of the arbor. The rambler's flexible canes bend over the top of an arbor and hang down, making their blooms more visible from below. This creates a cascading of flowers when they do bloom. Because these ramblers only bloom once, you can prolong the appearance of blooms by also planting climber roses on the opposite side of the arbor. Climbing and rambling roses don't use tendrils which means they will need to be tied to the support to keep them in place. Don't use wire as it may cut into the canes. Green plastic tying ribbon or twine make good ties. 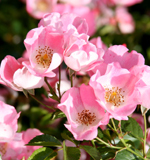 Climbing roses and ramblers grow best in a loamy, free=draining soil with a pH that is slightly acidic (6 - 7). Most grow best in full sun with at least 8 hours of sunlight. Roses are heavy feeders, so apply a balanced slow release or organic fertilizer containing micronutrients in early spring. Re-blooming varieties flower on new wood and should be pruned back hard when dormant to stimulate additional new growth. Ramblers should be pruned immediately after their blooming cycle ends so new wood has time to grow and harden over for the rest of the growing season. The following year's bloom will appear from this growth. Pruning ramblers when they're dormant removes the buds that will produce flowers in the following year.